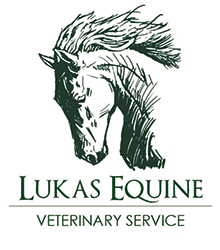 Lukas Equine Veterinary Service is committed to providing preventative equine care for common ailments through vaccination and deworming programs. In the face of a disease, especially when contagious, Lukas Equine can offer biosecurity recommendations to help prevent further spread. Lukas Equine also offers nutritional consultations and recommends exercise programs for individual horses. Lukas Equine Veterinary Service offers digital coggins reports and health certificates as well as professional dental care for your horses. The digital coggins reports and health certificates may be emailed straight to the owners. Lukas Equine also performs professional dental care. This is recommended about once yearly for most horses and may prevent common equine ailments such as weight loss, not gaining weight, colic, or decreased performance. Lukas Equine dedicates time for client education. Dr. Lukas has spoken to various groups (4-H, pony clubs, riding associations, owners, and trainers) on topics involving our beloved equine animals. To schedule your next preventative equine care appointment, please contact us today.